With the release of its PC 373D, Sennheiser has announced the new reference headset for competitive PC gamers around the world. As the successor to our popular PC 363D, it is the definitive choice for gamers seeking to be fully immersed in their gaming sessions and that demand a very high quality surround sound level. With the release of its PC 373D, Sennheiser has announced the new reference headset for competitive PC gamers around the world. The new high-end open acoustic gaming headset by the leader in audio delivers incredibly immersive 7.1 Dolby Surround Sound and crystal clear gaming communications thanks to its high quality, noise-cancelling microphone. The sleek Surround Dongle and user-friendly software perfectly optimizes the experience for immersive gaming, and even music. The superior features of the PC 373D are matched by its style and comfort to enhance your gaming experience, even after hours of playing. For an unprecedented gaming experience, the Dolby Surround Sound technology uses the shape of your ears to simulate the projection of sounds from different angles, creating a stunning 7.1 experience with a two-speaker system. Powered by Sennheiser´s unique transducer technology for optimum clarity and accuracy, the high-end open acoustic gaming headset is paired with a sleek and intuitive new Surround Dongle, designed to optimise the sound experience at a single click of its Dolby button. “The all-new software incorporated into the headset’s Surround Dongle immediately allows the gamer to both customize the sound to his needs and quickly switch between stereo and surround sound," says Troels Rasmussen, Product Manager Gaming, Sennheiser Communications A/S. The software’s elegant, intuitive interface tailors the experience to each gamer, their game, or their surroundings. The equalizer offers four settings including optimized modes for competitive and immersive gaming, an eSports mode, and an ‘Off’ setting that allows for a neutral sound performance. The PC 373D also provides a music mode for a premium audio experience. Thanks to its high quality pro noise-cancelling microphone and optional noise reduction algorithm, the PC 373D guarantees clear team communication with no background noise. Three side tone settings, easily adjustable via the software interface, allow gamers to choose exactly how much they hear their own voice. Sound is easily controlled via the volume button, which is neatly integrated into the right ear cup, with muting quickly and effortlessly achieved by simply raising the boom arm. The market-leading sound quality and technology behind the PC 373D is matched by its style and comfort. The stylish headset is equipped with large and comfortable XXL plush velvet ear pads that cushion ears during gaming, while the laser-cut open design aluminum ear-cups help players stay cool even as the tension rises. With its comfortable padded headband, the PC 373D is barely noticeable to the wearer, no matter how long the gaming session lasts. The PC 373D is available from July 2016 at the recommended retail price of $259.99 in the U.S. and $299.99 in Canada. 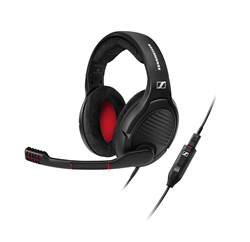 As a Sennheiser product, the PC 373D is built to last and comes with a two-year worldwide warranty.